Ferrari Opus : The World's Most Expensive Book! I'm a massive fan of big photography books. There's something amazing about the printed image that the digital world has yet to re-create. At the écurie25 Silverstone launch, I was able to take a look at the world's most expensive book! With it's diamanté crest adorning the front cover, and it's strictly limited sale to only 1 per country, the Ferrari Opus is yours for a mere $275,000! Thankfully, there are cheaper versions for the less extravagant amongst you, starting at a paltry £2,000. So why so expensive? Well this is more than just a book. It's everything you could ever want to know about one of the world's most recognisable car manufacturers. With images from Ferrari's own archive as well as virtually unrestricted access to the companies staff, factory and records, this really is a Ferrari "Bible". It's not small either! Measuring at 50x50cm and weighing 24kg, this is not the sort of book you'd want to take on the tube! 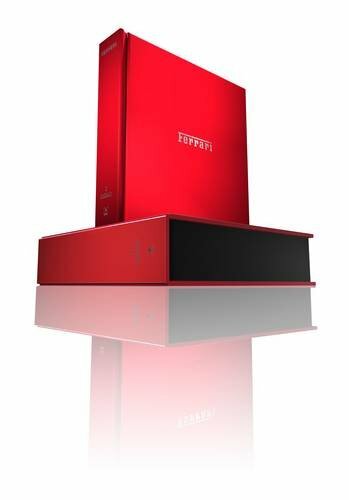 Each book is personally signed by (depending on which version you buy) several Ferrari legends and comes inside a specially designed clamshell, pushing the total weight to 37kg! This book is really epic. My favourite shot is one of Enzo Ferrari's desk, as it was left following his death in 1988, complete with reading glasses and fountain pen. There are so many awesome images in the Opus (over 2000) from throughout Ferrari's history. If you get the chance to see one, I recommend you do, whether you're a Ferrari fan or not. The diamanté edition of the Opus is currently travelling the world with the Formula 1 calendar. An iPhone and iPad version are also available from the App store (at a slightly more reasonable price too!). For more information on the Ferrari Opus, check out their website.